« Stephen Hollen – Improvisational storytelling with children. Camp directors talking about storytelling with children at camp. Post written by Zayanne Thompson, Ellyce Cavanough and Kate Fox. These camp directors. 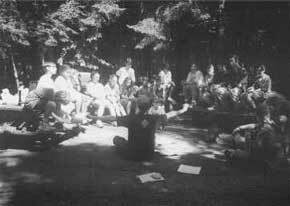 How have you used storytelling in camp settings? Zay Thompson Answers - Stories are a natural for camps. Camps offers an opportunity to create a meaningful and memorable connection to the outdoor environment. Educational research suggests that this connection to the outdoors creates a highly charged environment that facilitates learning. This emotional value of the camp experience opens the gateway for learning, and personal meaning provides the key to memory. As an educator I always imagine each brain as a closet. You can actually shove a lot of “stuff” into each closet, but without some kind of organizer, finding anything is pretty difficult. This is where stories come in. Stories provide the hangers that help to organize experience and knowledge for the kids (and adults!) at camp. Creation stories, coyote stories, made-up-on -the-spot stories, real life natural history stories, they all give meaning to the experience in a personal and memorable way. The other way we use stories, is to help people find their voice.Summer staff repeat a story they hear a senior staff member tell at a campfire, and pretty soon they are developing their “own” story. Staff read stories, repeat stories, and make up stories to tell their kids in their cabins at night. And the kids love it. They love it because the stories are being shared by an “elder”, by someone they respect who is taking the time to share adventure, friendship, challenges, or many other things (except fear, at our camp we never tell scary stories since emotional safety is important) through the safety of a shared experience. Stories can lead to great discussions, and the best staff use stories as a springboard for working out any issues that are going on in the cabin and to reinforce positive values and a sense of community. Ellyce Cavanough replies – Someone has said, “God made man because He loves stories.” (N. Scott Momaday) The storyteller is a magician, artist and creator who uses themes of life’s challenges and connection to the natural world to teach about relationships. Storytelling is an experience that contributes to the listener’s life. Folktales, especially when shared through storytelling, help children find meaning in life. Bruno Bettleheim has said, “When children are young, it is literature that carries such information best.” He believes that stories must entertain children and arouse their curiosity if they are to hold the child’s attention. They offer enrichment to the inner life of children. Folktales carry important messages. Folktales can convey to the child the advantages of moral behavior. Folktales offer “new dimensions to the child’s imagination which would be impossible for him to discover as truly on his own.” (Bettleheim) The form and structure of storytelling provides images to the child so that he can create his own daydreams. Folktales deal with existential dilemmas, such as the death of a parent or an aging parent, in a simplified form that allows the child to come to grips with the problem. The traditional Native American lives in the company of stories. The indigenous storyteller imparts the traditions and beliefs of his culture to his community through his stories. and what are your some of the best stories you use? I love creation stories. And coyote stories (as long they are appropriate – you have to be careful!) I love telling stories about real people or stories that we can learn from. One of my favorite books is called Peace Tales that is a collection of short fables from around the world – all with morals of course. But they are a terrific springboard for discussing real life situations. I also like guided imagery for empathy. Personally, I really enjoy stories so I find that I tell different ones all the time, I am always looking. Every week of summer camp, right before the kids get here, I meet with staff to share a story. I never choose the story ahead of time because I want to tell the story that needs to be told that day. The story starts our week, it gives meaning to our experience working with the kids at camp. Ellyce Cavanough replies At Free Spirit Nature Camp I selected storytellers who included Native American oral tradition as part of their collection of stories because they are about man and nature. This vital relationship is severely lacking in our modern, technological world. Native American folktales promote understanding, appreciation and caring for the Earth and all its living beings. These stories form a link between human society and nature because indigenous people live more closely to the Earth. They use natural images to teach both about relationships between people and between people and the Earth. Plants and animals alike were considered brothers and sisters to the Native American. Stories are magical and the storyteller is captivating. Through storytelling children are the center of their learning experiences. One of my favorite American Indian stories is, Gluscabi and the Game Animals (Abenaki, Northeast Woodlands). At camp the children heard this story many times and eventually learned to enact it themselves. It has a powerful message about conservation and stewardship of wildlife. Through the power of storytelling this learning experience will never be forgotten. Zayanne Thompson is the Program Department Head at YMCA Camp Surf, part of the camping branch of the YMCA of San Diego County. She is also an accreditation visitor for the American Camping Association (ACA), and is on the state board of the Association for Environmental and Outdoor Education (AEOE) in California. As a credentialed teacher with a degree in environmental biology and advanced degree in education, she has worked with children in the outdoors through museums, the national park service, and for the last fifteen years in residential environmental education and summer camp programs. She lives with her family on a resident camp located on the beach in Southern California. Kate leads the camp community and designs the program. Kate has seventeen years experience managing programs for children, including ten seasons of summer camp. She shares her understanding of ecology and respect for nature through unique, creative activities that emphasize cooperation and healthy physical and emotional development. Some of her favorite camp activities include outdoor cooking, small and huge puppet-making, tie-dying, parachute games, adventure challenges, cooperative and multicultural games, learning about birds, and exploring at the pond. She has directed summer camp and after-school programs for the YMCA, the Boys & Girls Club, and other Youth Service organizations. When she is not at camp, she is developing programs for middle schoolers focusing on conflict resolution and character education. This is her eleventh season at Camp. This entry was posted on Tuesday, June 5th, 2007 and is filed under Brother Wolf, Coaching Storytelling, Environmental Storytelling, Episode List. You can follow any responses to this entry through RSS 2.0. You can leave a response, or trackback from your own site. There are all types of camps, kids and stories. For the past three years I have told stories at a sport camp in Florida where the weather is hot and it rains almost everyday of the summer. Aside from getting the kid out of the rain or sun, storytelling can give them down time for their bodies and up time for their imagiantions. Winning isn’t everyting, concideration of others, meeting challenges, believing in self, try your hardest, are only a few of the themes we can address through story.